Embarking on a 120-ish mile jaunt around Wiltshire — with Salisbury Plain, stone circles and tanks carrying L-plates. I love chalk. Not the school blackboard variety, but the landscapes produced by this great swathe of ancient limestone that sweeps right across southern England. Find the right A and B roads, and you’ll be sharing these chalk hills with little more than the occasional skylark. Mere – start and finish of this day ride. 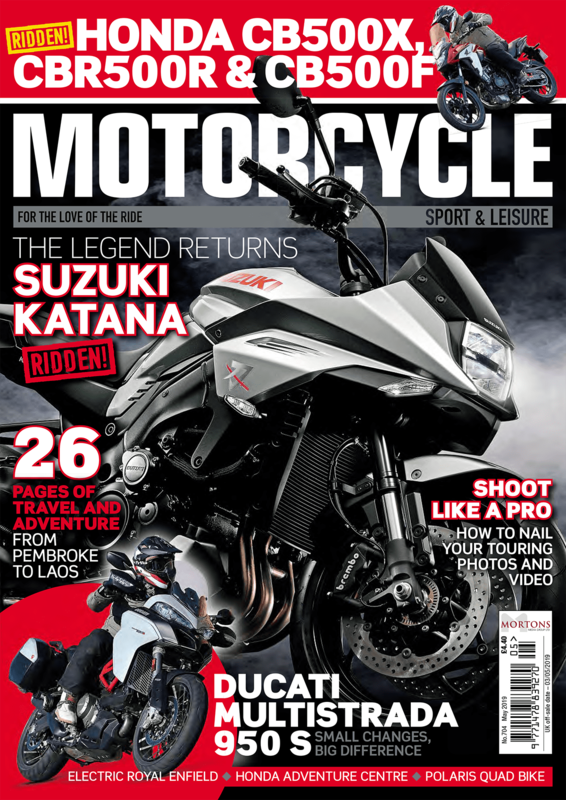 For this day ride, start in Mere, head east through town, under the modern dual-carriageway and follow the B3095, which climbs suddenly and dramatically upwards onto a chalky chunk of Salisbury Plain. If you were able to stop and look back (which you can’t) you would see magnificent far-reaching views to south and west. I used to think of Salisbury Plain as a high, flat plateau, but it’s actually cut through by several rivers, and after a couple of miles we drop down alongside the Wylye, which rises just west of here. With a succession of 30 and 40 limits, this isn’t a fast piece of road, but we soon hit the A350, turn left and immediately right at the BP filling station to follow an unclassified road to Sutton Veny, where we turn right and immediately left on another minor road, which after a couple of minutes dumps us at the A36. This fast and busy main road is a bit of a culture shock, but it only lasts a couple of miles before we turn left onto B390. Through an army camp, then climb back up onto the chalk again with good views and a fast almost empty road before dropping down into Chitterne and forking left (signed Tilshead) for yet another minor road. 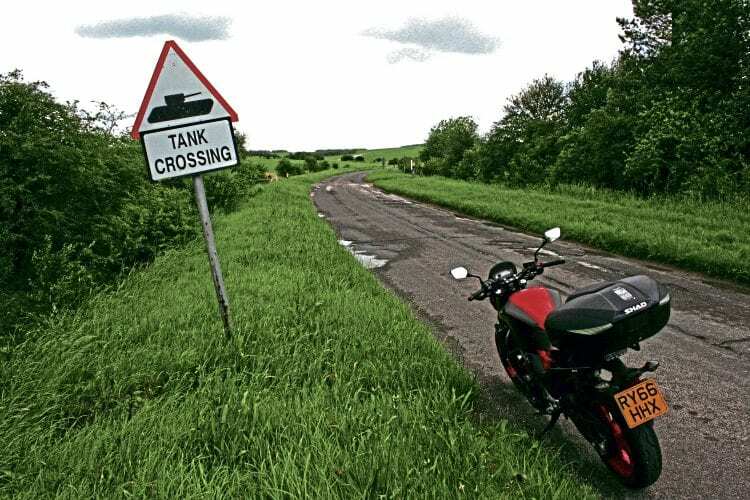 You’re left in no doubt that this one is virtually owned by the MoD – watch out for tank crossing, helicopters and signs saying ‘No civilian vehicles beyond this point’. Concrete military roads stretch off into the distance, but they’re out of bounds. At the A360 turn left for Devizes and follow a nice fastish road through an avenue of trees to West Lavington, though then it’s a succession of 30, 40, 50 limits and lots of solid white lines. 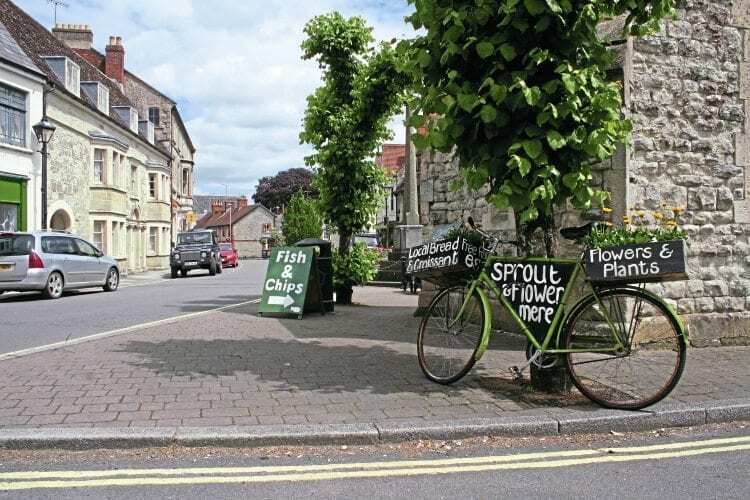 Through Devizes, follow signs for the A361/A4 and it’s a real relief to get out of this busy little town (famous for its long flight of canal locks, if you have time to stop). 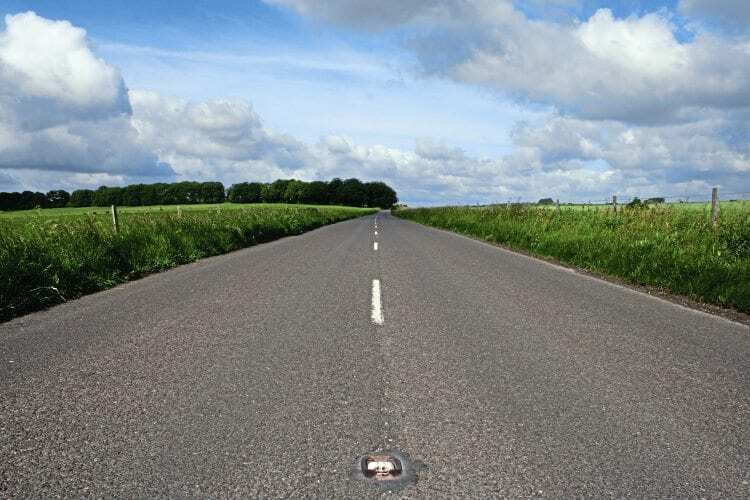 When you do get clear the release is sudeen, with the A361 catapulting you back into wide open chalk downland with big skies and far horizons. 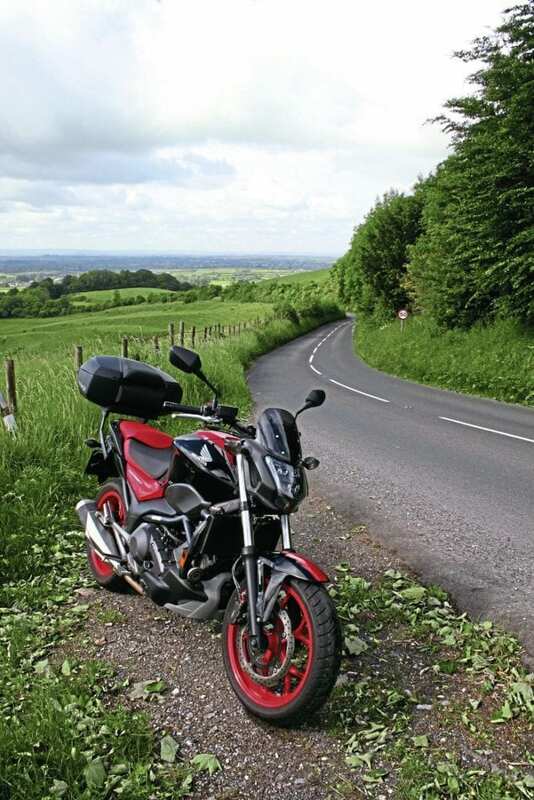 There are tempting byways on either side, and I have to remind myself that good as my long-term Honda NC750 is, it’s no trail bike. But for this sort of day ride it’s ideal, with the pace to make progress on the open sections while staying relaxed. You’re never far away from Stonehenge. 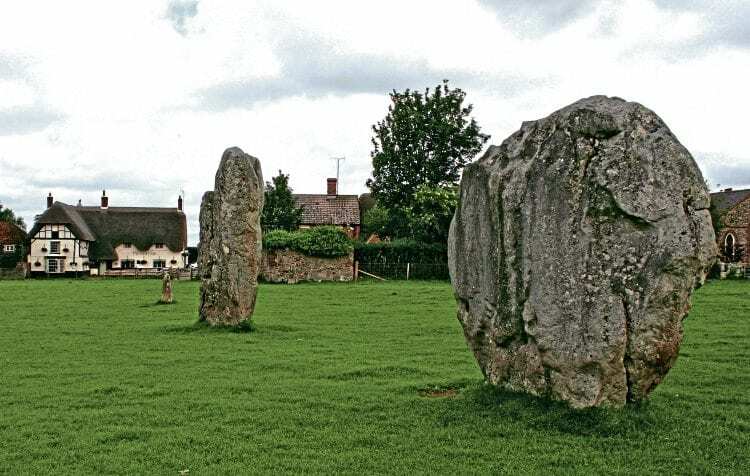 We’re now in the Wilts pre-history region, which holds Stonehenge, Avebury, Silbury and the start of the Ridgeway – there are more barrows, mounds and chalk figures than you can shake a Channel 4 TV historian at. Cross the A4 and it’s a mile to Avebury, where if you want to stop and see the circle use the main car park, because there’s nowhere else! The pub here claims to be the only one in the world inside a stone circle, which I’m sure is true. Avebury is the ultimate stone circle. Away from the stones, the road is now renamed the 4361, a sure sign that it’s not intended to be used as a through route. Whatever the name, it’s a glorious piece of road, alternating between twisty sections and open straights. It culminates at Wroughton (an ex-RAF base, now a sort of overflow for Science Museum exhibits) and suddenly there are far reaching views from this chalk high ground over the flatness of Swindon and points north. Drop down into Wroughton village and (unless you want to battle your way through Swindon) turn right onto B4005 and follow this B-road up to the A346. It’s time to head back south, so that’s what we do, taking the 346 right for Marlborough. We’re back in the traffic now, but you can’t avoid it forever. 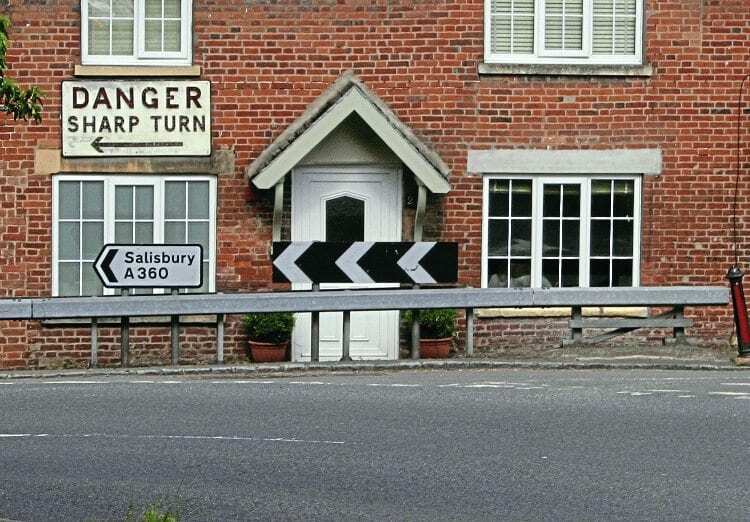 If you feel like a cuppa in Marlborough, turn right at the bottom of the hill and park up in the extra-wide high street If not, turn left, then right at a mini roundabout to stay on the A346, climbing up steeply out of town and into Savernake Forest. There’s a short stretch of three-lane up the hill to get clear of the town traffic, though I didn’t encounter much apart from a white van and a tank wearing L plates! Riding through the ancient forest is eerie, but watch out for the road’s sudden twist over very narrow canal and railway bridges. At the roundabout, join a faster stretch of A338 for a while before forking left onto A342 (signed Lugershall) after Collingbourne Duds (or the 346 fork earlier, which I missed) and we’re back onto a very quiet A-road back up onto higher chalk. The traffic builds again and slows on approach to Weyhill where we join what was the old A303, suddenly cheek by jowl with modern dual-carriageway. 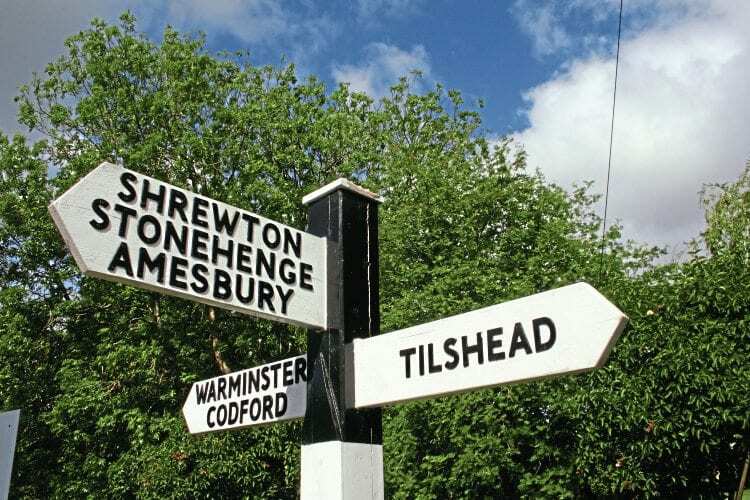 At a fiendishly complicated roundabout, follow signs for London A303 and join the dual for a couple of miles around Andover, which incidentally is where Norton Commandos were built – a distant remnant of the company is still there, and can supply almost every part needed to build a new one. At the second exit take the A3057, which twists six miles down the Test Valley to meet A30 at Stockbridge. More tea and cake opportunities here. Stick with the A30 all the way to Salisbury – again, we’re on classic high chalk with good views though the road gets busier when its joined by the 343. Through Wiltshire’s only city, follow signs for A30/A36, the roads splitting at a roundabout a few miles out, where we turn left for MO, twisting through Wilton with eyes left for the magnificent (and incongruous in this very English small market town) Italianate church. NC750 delivered a good day out. At Burcombe another few miles on it’s right onto B3089 where the main road goes sharp left. This is a lovely twisty B-road though rolling countryside which takes us back up onto the high part of the Plain. At the A350, take a right turn and then immediately left before joining the modern A303 (single carriageway here) for a final drop off the edge of the plain to take first exit off at the bottom for Mere, back where we started.